Monday - Friday 4:00 - 7:00 P.M. Train travel might sound like an ancient practice to you, and well, it is. However, it’s making a comeback- much like our dear DTLA- people are abandoning cars and using other methods to get around, the metro, subway, Amtrak, train, whatever you call it- tracks are back, baby. What does that mean for train stations? They’re returning to their former glory. Back when trains were the only way to get around most train stations were a hopping place to wait for your ride, grab a meal, read or actually finish a crossword, you know, things people did before TV. 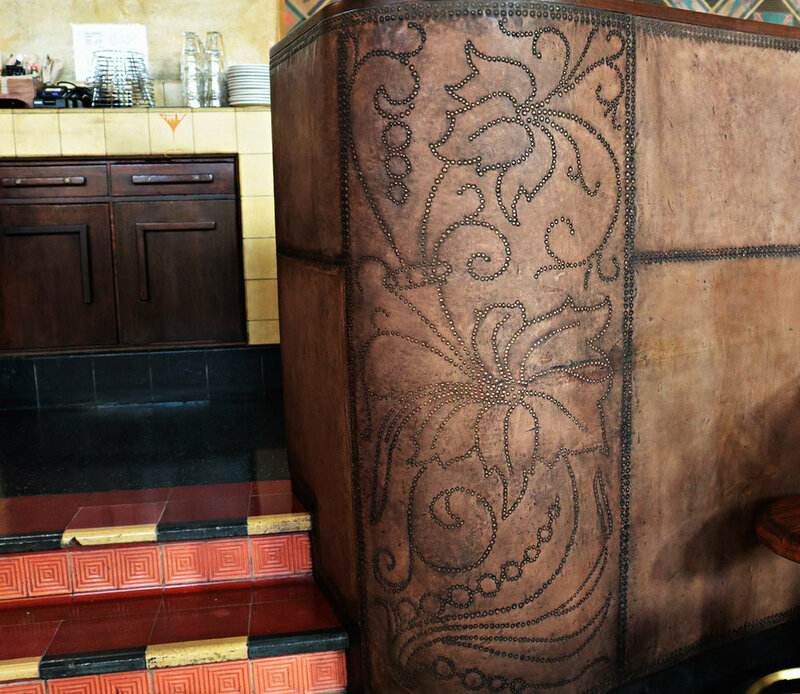 They were works of art and admired by many, Union Station in Los Angeles is no exception. Nicknamed the “Last Great Station” Union Station was a little late to the train game. It opened up in 1939 just as train travel had already started declining in popularity, but it quickly became the most popular station in the west thanks to World War II. If you can’t imagine how people entertained themselves before cell phones, you might understand why train stations needed high-end bars and restaurants- to pass a great deal of time, to celebrate a homecoming, and to prep for the journey to come. Union Station is pretty huge, it has two entrances, multiple rails that travel all over California and as far east as New Orleans, a private event area, a Starbucks, a restaurant (Traxx), multiple cafes, a bar, and now, a brewery. Imperial Western Beer Company just opened up in what used to be the second restaurant of Union Station, located on the right side from the Alameda Street entrance. Back then it was named the Harvey House, a franchise of eateries that were always in train stations from the 40s. They were owned by a man named Fred Harvey. Think of it as an early Hooters, and much more modest. The Harvey House was shut down in the 60s as people opted for cars, planes, and the suburbs of outer Los Angeles areas. The same thing happened throughout the country and thus the entire franchise came to an end, and this area of Union Station in particular was abandoned. It wasn’t until 213 Hospitality Group put its eyes on it and immediately monopolized on the space available. It took about a year and a half but finally, Cedd Moses and his team opened up a brewery that now occupies the historic Harvey House. It’s still a restaurant, but with a brewery, and it has a speakeasy. Oh and of course, a pretty solid happy hour. The space is simply giant, booths adorn the left and right sides, with the main bar directly in the middle back part of the venue, keep heading back, and to your right, you’ll find an entry to a fully open patio bar, keep going and you’ll hit the brewery. Not usually open to all the public, but we politely asked for a tour and the friendly staff gave us a behind the scenes view. Mention Happy Hour City and who knows- maybe you’ll get a tour! Back in the main area with your back facing the entrance, to your left lies a door to the speakeasy, The Streamliner, another signature sign of 213’s touch. We were greeted by Steven Zakarian who happens to be the friendliest and most passionate brewer we have ever come across. Having helped Mr. Moses out with multiple 213 projects, Steven is managing the joint along with fellow coworkers Brian and Peter. They’re maintaining the brewery in the back, under top-notch conditions as we got to see. There are games and friendly areas where coworkers joined each other for some between work fun while we were there. It’s hard not to stare and wander around the historic venue, it forces you to put your phone down which we love. The inside decor matches the Spanish Mission architecture Union Station has and the fixtures are an art deco inspiration to be admired. According to Steven, the vibes are currently very chill, with busy weekends and calmer weekdays. Most people there during our visit were suits, the occasional traveler, and couples on lunch dates. Now on to their Happy Hour, we’re going to do this similarly to how we did our Breweries Edition reviews back in April, and let you know ahead of time the beer options we had probably will not all be the same as when you visit. All you have to know is we will let you know if it was good or not, but also Stevens says the menu is developing, Happy Hour is a multi-dimensional thing that can and should be constantly changing anyway, so make sure to check their social channels or call if you’re curious about their most current selection. The Happy Hour at Imperial Western Beer Company needs further developing, Steven advised us that by the time this article is posted it might not be the same. 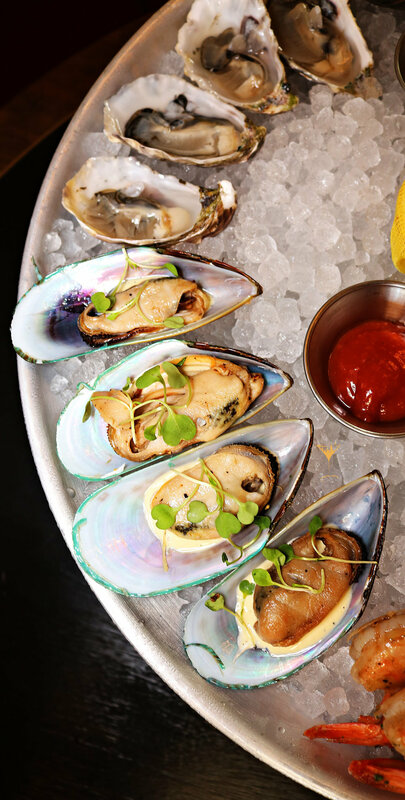 However, as it stands the deals are the following- $1 oysters Monday-Friday from 4:00 - 7:00 P.M. but more importantly, there is a rotating selection of pints that is $5 all day, everyday. To check out their list that is updated everyday click here. The beer is divided into categories that make sense! That was a huge plus for beer beginners such as Mariana. There is a wine and cocktail list so don’t worry non-beer drinkers you’re not alone. As for the food, it is a central seafood base theme, but don’t worry carnivores you got options. We mistakenly came with an appetite so we did order most of their star lunch and dinner dishes, plus tried some of their other drinks and opted for a flight of the beers. Our writer Ronnie came with us so without further ado let’s dig in. A: This beer is very smooth, it’s light, it doesn’t have a strong aftertaste. I actually can detect a nice creaminess that lingers. It’s nothing crazy or extensive- just smooth. I’d pair it with a very heavy meal. R: I am getting some mild but tangy notes. I expected it to be sour but it is not. It is actually as Alex said very creamy and almost milky. M: It’s very light, kind of perfect for me, I’d pair it with the seafood. My favorite thing is that it’s named after Fred Harvey which is cool. A: This is a very bitter beer given that it is a single hop, but it’s not strong. It doesn’t ring of a true IPA to me because it’s lacking crispiness. It’s not bad but I prefer the Hef. R: Oh wow! Yeah I agree, that’s a very hoppy aftertaste. It’s almost like a knife on your pallet how it ends. Took me by surprise for sure. M: Way too bitter for my taste. The aftertaste also lasts too long so it’s bitter from start to finish. A: Now this is a true strong IPA! It’s crisp and clean! It doesn’t sit on the tongue long and it has a good aftertaste. I like it! R: When I drink this I can imagine myself enjoying it on a nice hot day, refreshing but not overbearing. It’s not as heavy as the other IPA. I even detect some citrus. Yummmmm. M: I can definitely taste the citrus notes in this one but it’s still too bitter for my pleasure. A: Pretty light for a stout. However, it does have the smooth notes from a stout, that’s what you want. It is less creamy than the Hef, but I like it. The coffee is apparent, and I like that. R: No joke, if I didn’t know that was beer I’d chug it as coffee. Very smooth, not a heavy stout at all. I love coffee so I love this stout. M: Oh I actually quite like this. Don’t know if I’d drink it in the morning but the scent is pleasing and the taste is sweet. M: Margarita is a margarita. It’s well tequila, a little overpowered by lime juice, but it’s a well cocktail. Light on the simple syrup which I can appreciate, but it is a lot of lime juice. Yet, I love lime so I'm conflicted. Is it a good margarita? It’s ok. Is it a strong margarita? Not for the price. Still, being able to make a drinkable margarita is always a plus in my book. R: Negroni is a little Campari heavy but I do love me some Campari. The aftertaste is all the botanicals from gin, which mix well with the Campari. I dig it. 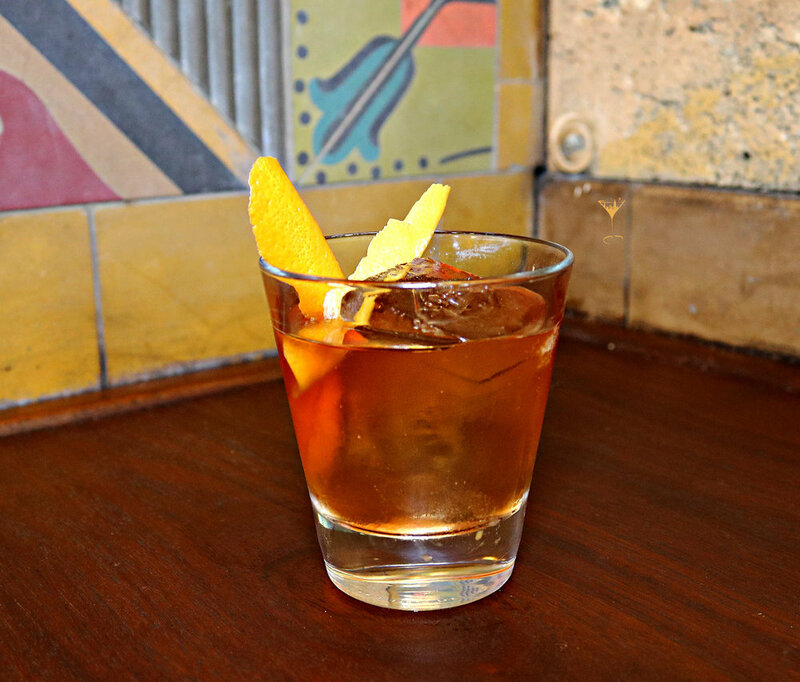 A: This Old Fashioned was made with well-bourbon, bitters, sugar cube, orange twist, and a splash of soda. To be completely honest, I don’t like the splash of soda, I feel that’s why it’s less smooth and watery. That’s my preference though, some people don’t like the strength of OF’s, I do. Mussels, Scallops, Oysters, Shrimp, Clams, and Ceviche. 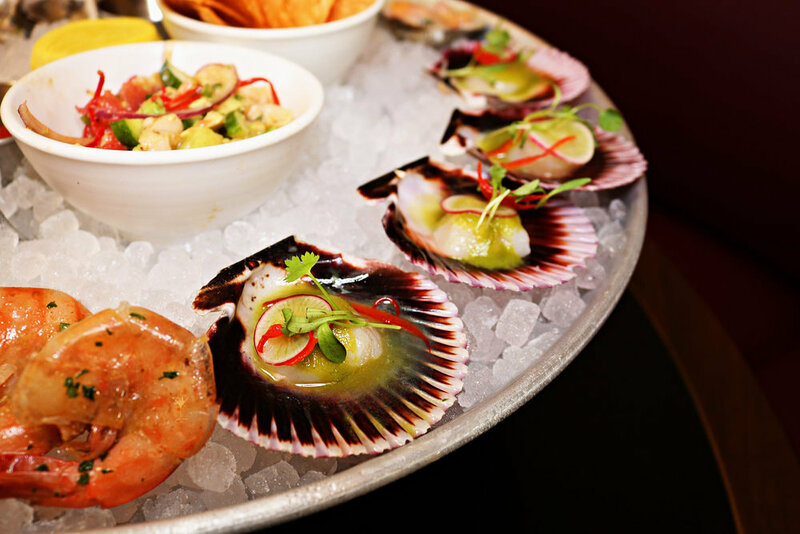 M: The ceviche is amazing, the shrimp is well cooked, the scallops were shockingly delicious, I am still not an oyster person. It is a gorgeous presentation though and definitely good for sharing. A: The mussels have a certain smokiness to them, they’re very well prepared. My favorite of the platter for sure, the scallops are good, the Kumai oysters are good quality and refreshing. Scallops are great, the chips were even good. R: The smoked mussels are my ultimate favorite. The scallops are also very well done and the presentation for me really tied it all together. I mean it’s a beautiful plate. M: Eh… It is sadly a bit flavorless. I didn’t expect it to be a dish bursting with flavor but the flavors advertised are missing. A: I think in terms of the consistency of the dressing it’s nice but for it being a mustard vinaigrette I taste no mustard, instead it’s very oil based. R: Yeah, I agree with Mariana, to me it is overall just very bland. Maybe we should have asked for extra dressing. It is healthy option though..
A: Enjoy hot. To me, it needs something, a dressing, or a seasoning. M: The flavor is all in the crumbs. I like the charred burnt taste. Otherwise, if you don’t dig mushrooms or cauliflower then don’t order this. R: In terms of size it’s a big cauliflower. The flavor is all on the top you have to get the breadcrumbs in the bite when you dig in. A: The sauce they come with is very well prepared. It’s like tartar with dill, I like it but I don’t like the texture of mushrooms so I am biased. M: Hmmmm...Much like the cauliflower if you don’t get any sauce you’re just getting a fried mushroom… But I love mushrooms. So I am also biased. R: For me, a non-biased mushroom eater, the tartar sauce was made with a lot of basil. Which I prefer to dill, but yeah if you don’t get the sauce the mushrooms are pretty basic. M: Yikes this burger is heavy with horseradish! But the meat is perfectly cooked, I like my burgers a little bit rare side so this is a bonus for me. The bun is toasty, not soggy and it has been sitting for a second, which means the consistency of the bun is good. The horseradish kind of consumes it though, I can't taste the cheese. A: The meat falls apart perfectly in your mouth, you can tell it’s quality meat. When the meat can speak for itself always a good sign. The certain flavor they were aiming for is accomplished. It’s all about the patty so yes, the Gruyere taste is light, but Gruyere cheese is supposed to be light, it is there to bring out the rest of the flavors and it does the job.. Pickles are a nice addition and they’re not the store-bought pickles. You can tell the flavors and spices from the pickling are very good. It’s light, crisp, and vinegary sweet but the kick of spice at the end ties it all together. R: You have the classic burger ingredients with quality meat, I love the onions- overall I like it! The brioche bun is a nice touch. It is reminiscent to me of a french dip feel. Overall very good. A: I prefer my chowder thicker, it’s more on the watery side, but the flavor is there. It’s pretty basic, not spicy, but solid. It has everything including good chunks of clams in it. The bacon also adds a good flavor. It’s a very good, hearty, good to eat when you’re at home and it’s cold outside. R: The chicken seems to have a coriander addition of spice I wasn’t expecting. It’s not bad, but surprising that’s for sure. It is reminiscent of a Moroccan thanksgiving to me. M: My favorite part of the whole thing was the chipotle. It was perfect, the chicken was cooked right and juicy. As a pickle hater though, I prefer the burger. A: The buttermilk crust of the fried chicken is what holds the coriander. So the flavors that are all in there aren’t classic, they’re joining the revolution in creating their own. They’re trying to stand out and it does. It holds it’s spice. I do like it better than the burger. M: These tacos are my favorite so far! I like the salsa flavors and the tortilla has solid consistency. The cabbage is fresh and crunchy, the right flavors are all there, it’s not too spicy! There are citrus and lemon notes plus it doesn’t hurt that the mahi-mahi is good quality fish. 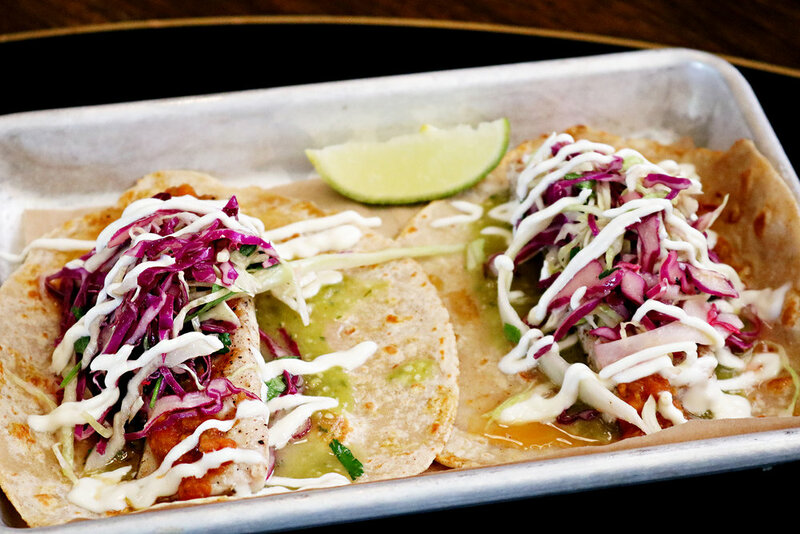 It’s a fish taco done right. A: This is delicious. Perfect treat for the holidays. The ice cream is so sweet, not watery and the apple pie is perfectly warm. M: Just like momma used to make. Just kidding my mom never made these, but it tastes like she would! Man this takes me back to my Texas days. The crust… is perfect. R: Respect. We all dug in at once, it is really very good traditional apple pie. Perfect end to the meal. 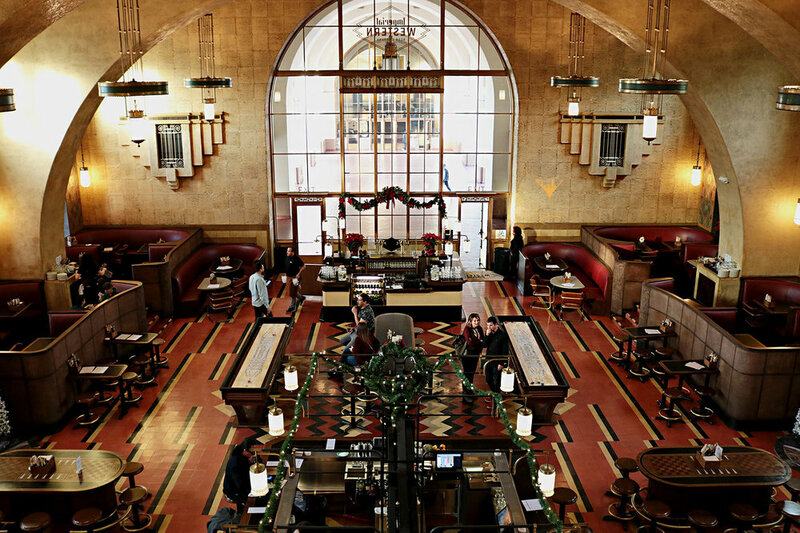 The Harvey House was a historic point in Union Station’s history, so it is admirable how much the team of Imperial Western Beer has cared for the overall function of the place and how well decorated it is. The ode to the past is not slept on and patrons will be inclined to have a good look at their surroundings instead of their phones or whatever other screen they can find. We cannot comment enough on how happy we were to see people interacting not just with each other but the space itself. The bartenders were all smiles and that goes to show they also enjoy working there, a little love goes a long way. The food is reminiscent of a higher quality diner, it’s the place you’ll want to go when you know you’ll get a good hearty meal each and every time. Those curious about the beer are highly encouraged to visit when Steven is working, his passion, hospitable, and laid back vibes will have you talking to him like we did- for hours. If you’re a seafood junkie, this is a hot spot for you, and beer fans will appreciate the daily pint deals. 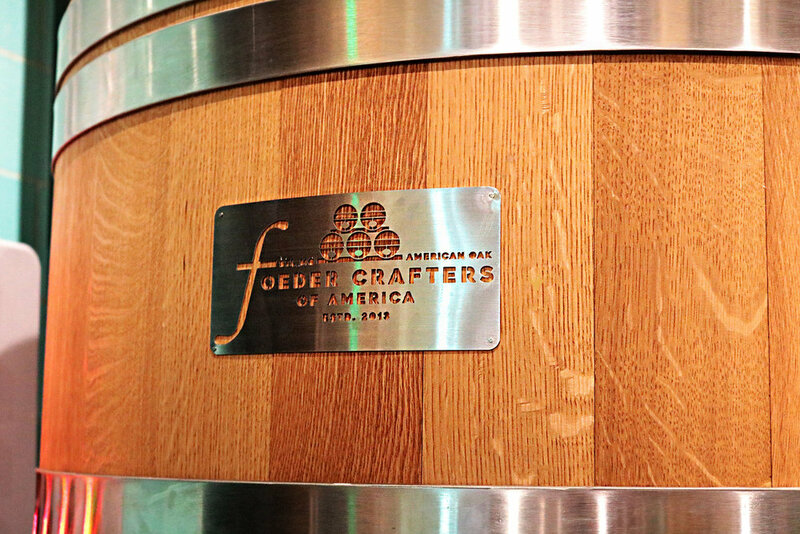 Their collaborations with fellow 213 breweries caught our eye but unfortunately were not part of the deal. Their wine selection looked plentiful too and Steven says they’re going to do a lot more with that. We’d like to thank Steven and his team for allowing us to come in on a beautiful day, photograph the hell out of their venue, and get an inside look at how much they truly care about the operation they’ve created there. 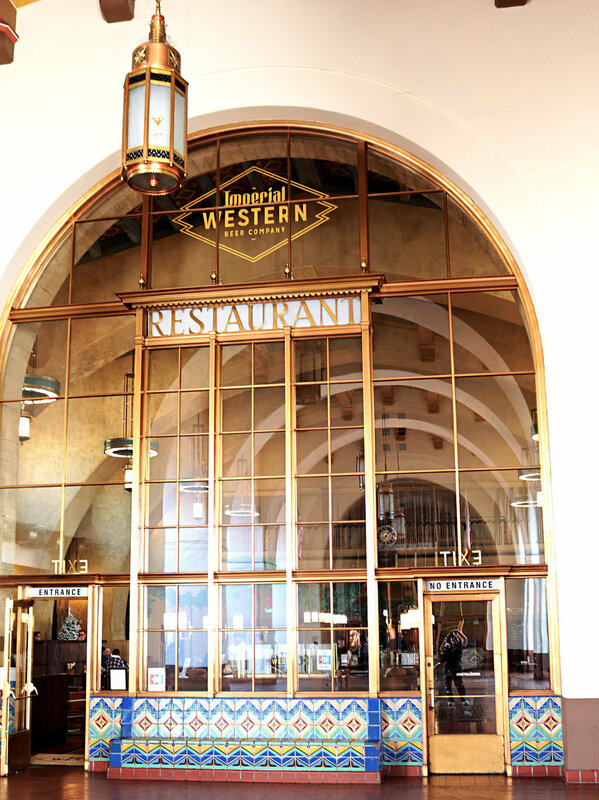 Imperial Western is breathing life back to Union Station and perhaps it will encourage people to visit this part of LA’s history more often. Whatever ends up happening with their Happy Hour we highly recommend visiting during any time of the day. as they do have awesome lunch, dinner, and brunch specials as well.